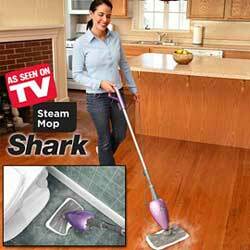 Shark Steam Mop combines the power of hot steam with a triple action micro-fiber pad to loosen, lift and lock dirt in place. Lightweight (3 lbs), easy to operate steam mop uses water so it saves money spent on costly abrasives and is safe on vinyl, linoleum and hardwood floors. Obliterates tough grime, disintegrates scuff marks, melts away sticky messes, and absorbs muddy footprints. Eliminates mop wringing and carrying water bucket. Non-toxic; no chemicals left behind. 2 machine washable pads. 11 3/4" x 7 x 47. Set of three pad refills are 13 1/2" x 7 1/2 x 3/4".